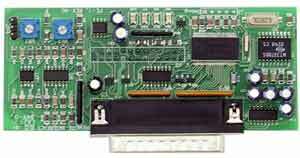 The PE-1 is a single board that installs inside the RI-300. It adds a full duplexed link or repeater ports to the RI-300 controller. As a repeater port, it can operate completely independent to the RI-300 with its own command processor. The PE-1 can be assigned to channel 9 on the auxiliary buss which will not interfere with other items on the buss. The PE-1 is a full featured repeater controller that can be customized for your application. Hang time, time out timer, courtesy tones and CW ID interval are all programmable. The PE-1 supports both emphasized and non-emphasized audio. Within the PE-1, the repeat audio path also includes low pass filter and remotely adjustable digital pots. You install the PE-1 inside the RI-300 Chassis. The PE-1 includes a programming port where you can modify all system functions from your PC/Windows95, 98, ME, NT, 2000 or XP operating system. You can save, upload and download files to your repeater controller. The PE-1 has 2 digital inputs and 2 digital outputs and is expandable to 8 outputs. These inputs and outputs are user programmable. The inputs can trigger macros and change the controller operation. These inputs can be used for alarms and many other applications. The output can be directly controlled or controlled with macros. The outputs can be used to turn on or off external items or by using programmable timers and internal events the outputs can be use to automatically turn on and off an external fan when the transmitter is on the air. The PE-1’s macro command editor is unlike many other macro editors, for a controller its size and price. You can create and assign a 1 to 5 digit name for your own custom user commands. The PE-1 comes preprogrammed with some user commands, including turning the repeater, TSQ and other items on and off. The PE-1 has 2 programmable sine wave tone generators. Both of these generators are individually controllable as to frequency and level. The frequency is adjustable from 500 Hz to 2500 Hz. The level is adjustable in a range of 0% to 100% in 10% steps. You can then use the output of these generators to send Morse code or various beeps. The PE-1 has a full duplex auxiliary expansion buss. The PE-1 can be assigned to any channel on the auxiliary buss including channel 9. Controllers can even pass commands to each other. On the expansion buss, a controller can operate as a repeater, link or remote base. This auxiliary buss architecture of independent controllers for each radio ensures maximum flexibility and reliable operation of your system. The PE-1 can be completely customized for your application. The programming mode has security password features to avoid unauthorized programming access. Through programming, you can setup your controller with System Commands. You can access and program the PE-1 over the programming port, while the repeater is on the air and without the repeater users knowledge. With the programming software, you can read the current status into your computer, make modification and download your changes to the controller. The programming software runs on Windowns95, 98, ME, NT, 2000 and XP. Active high and/or active low NSQ (Squelch) and TSQ (CTCSS) inputs. Active high and/or active low PTT output. Two sine tone generators with frequency control. Fully programmable user command and macro editor. Digital potentiometers, remotely critical audio levels. All features are programmable in a windows programming interface. Watchdog and power supply supervision. 2 user programmable digital outputs, expandable to 10. 2 user programmable digital inputs. Supports Remote control of Synthesized radios. Supports serial data control to EchoLink. Transmit audio select, Flat and Pre-Emphasis. Receiver audio select, Flat and De-Emphasis.